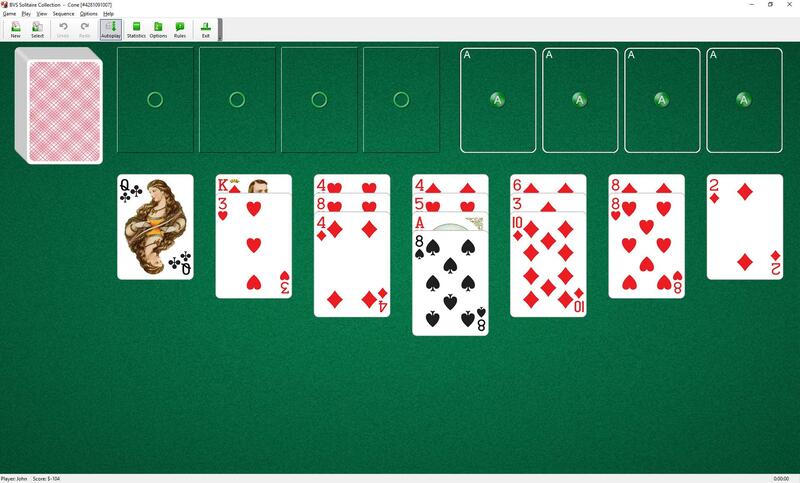 Cone Solitaire uses 104 cards (2 decks). You have 7 tableau. At the start opf the game the 1st and the 7th pile contains 1 card, the 2nd and the 6th pile contains 2 cards, the 3rd and the 5th pile contain 3 cards, and the 4th pile contains 4 cards. You have 4 foundations. An Ace of each suit is moved to the foundation piles during play as they become available. To build the foundations up in suit, wrapping from King to Ace, until each pile contains 26 cards. Only the top card of each pile is available for play. You may build tableau piles down in sequence and alternating color, wrapping from Ace to King as necessary One card or group of cards in the proper sequence can be moved from pile to pile. When any tableaus are empty you can fill the space with any card or legal sequence of cards. When you have made all the moves initially available, click on the stock pile to deal one card onto each tableau pile. All gaps (empty spaces) in the tableau have to be filled before the deal. The last four cards in the stock pile are dealt to four reserve piles. You can move cards from the reserves to the foundations and to the tableau. You win when all cards are moved to the foundations. 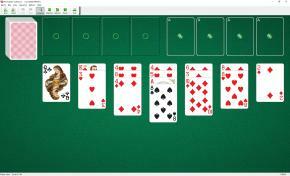 Cone Solitaire is one of the solitaire card games included into the BVS Solitaire Collection.